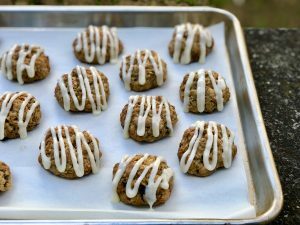 These cookies are a twist on the classic Carrot Cake. Besides the fact that they are in cookie form, I have added in rolled oats, freshly grated nutmeg, and dried cherries (you can leave them out or swap in any other dried fruit that you prefer). These are really easy to make and the cookie dough stores really well portioned out in the freezer for up to a month, just let them thaw on the tray while you preheat your oven, and you may need to add another minute or two to the baking time. In a medium bowl combine the flour, baking soda, coarse salt, cinnamon, nutmeg and whisk to thoroughly combine. In a large bowl combine the butter and brown sugar, whisk until smooth then add the eggs one at a time, whisking in between. Add in the vanilla and whisk until combined. Add in half of the flour mixture, fold in with a spatula until combined, then add in the rest of the flour mixture, the oats, the carrots, and the dried cherries; fold thoroughly until a soft dough forms. Cover the dough with clingfilm and chill for at least 1 hour or up to 3 days. Preheat your oven to 350ºF (180ºC) with the fan/ventilation switched on. Prepare your baking tray with parchment paper (if you have more than one baking tray, prepare 1 more). Scoop out your cookies with a medium cookie scoop onto your prepared tray, giving the cookies about 1inch of spacing in between (I usually fit about 15-16 per tray). Bake for about 10-12 minutes or until they are golden brown on the outside. Allow them to cool for 5 minutes on the tray, then remove onto a wire rack or plate. Continue to bake the remaining cookies. In a large bowl combine the cream cheese, butter, salt and vanilla; whisk until smooth. Add in the powdered sugar and whisk that until smooth as well. Once your cookies have cooled down completely you can put the glaze on top, either drizzle it on with a piping bag or spread with a spoon. Let them set for 10 minutes and they are ready. Store in an airtight container for up to 3 days.